Ummm. Mr. 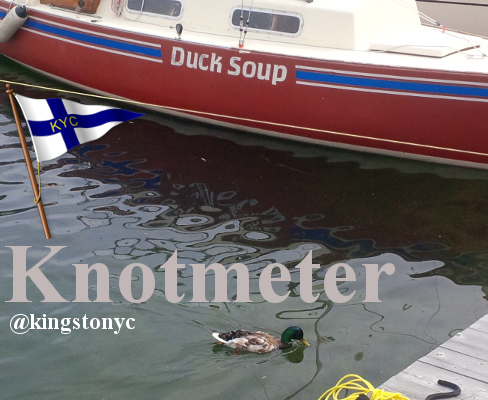 Duck, maybe you shouldn`t get too close to that boat. KYC Sailor Aidan Lawford Wickham places 5th at the Laser Canadian Championships! We are currently featuring Smithworks Brewing Company's Dunkelweiss, a complex, yet refreshing dark wheat beer. Come in for one before its gone! Up next is Beau's Festivale, their summer seasonal beer. Stay tuned for more exciting new feature beers arriving throughout the summer. July 1st Canada Day BBQ + Watch the Fireworks! KYC will be hosting a Canada Day BBQ starting at 5:30 on Wednesday July 1. We will have several BBQ specials from the grill along with a wide variety of salads, sides, desserts and more. Zach Callery will be playing blues and classic rock tunes on the patio (weather permitting) starting at 6:00pm! Check out his youtube videos here for a preview. Don't forget, KYC offers some of the best views in Kingston for the Canada Day Fireworks! Bring family and friends down and celebrate Canada's 148th birthday in style! Stay tuned for a time and date, and the wines that will be pairing. On Sunday, May 31, with the help of Marine Surveyor Capt. Richard Trainor, (Ontario East Marine Surveys) we did a preliminary review of stray electrical current in the waters of our Harbour. We found many of our fleet, plugged into shore power to have stray current entering our waters. Stray current, also known as electrical leakage, represents a significant hazard to people in the water near that boat. Please take a moment to read more about what you can do as a boat owner, what KYC is doing and the potential risk of injury to swimmers here. Now that school is out and our Junior Sailing programs are starting we will have an increased activity level on and around the property. 1. All dogs must be leashed and with their owner while on the property. 2. Driving out on to the breakwall is not permitted except with expressed permission from the General Manager. Monday Dinghy Racing Returns (at long last)! Adult dinghy racing was a large part of the KYC racing scene several years ago. We are happy to see it return! June weeknight and weekend racing is well under way! The (Practice) Sprints event will be rescheduled to a more opportune time. We are expanding usage of the white board at the bar to weekend events. Show up for the Skipper's meeting, sign up on the white board and you may get on a boat needing crew. As well, send email the Race Office at race@kingstonyachtclub.com, indicating your availability, for future matching with a boat. RC Duties have been assigned for the year. It's up to individual boats to complete their assigned obligations or swap with another boat to do so. For the Laser Master’s July 9th to 18th the need is a bit greater. · 7 in race – mark set, recorders, etc. KYC Signaling Cannon now on Display! Since running the story of the re-discovered KYC signaling cannon, we have decided to put it on temporary display in the main lounge at the Clubhouse. Take a look and admire this piece of ordnance from another day. Please click on this link, to read the whole story. You will notice in the calendar below that we have some events planned in conjunction with the various Laser Championships being held in July. During the listed dates, please note that your Club will be busier than usual. We will be hosting many of the participants, volunteers, and spectators for dinners and events on Club property. We appreciate your patience and cooperation during these times. KYC is proud to be a part of these events and look forward to hosting all those involved.